City Theatrical has provided the benchmark in wireless DMX systems for entertainment for over a decade with the award winning WDS™ and SHoW DMX® systems. 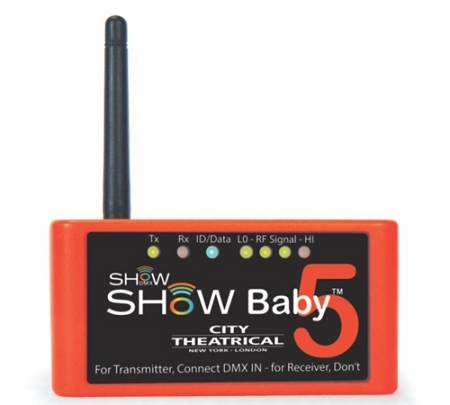 SHoW DMX SHoW Baby 5 is incredibly easy to use and incredibly affordable, while still offering the quality and advanced features of SHoW DMX Neo technology, so SHoW DMX SHoW Baby 5 is perfect for the venue or performance where a full featured SHoW DMX system might be too sophisticated or too costly. The SHoW DMX SHoW Baby 5 represents a breakthrough in plug-and-play wireless DMX and RDM transmission - a single unit that can be used either as a wireless DMX Transmitter or Receiver. Set-up couldn’t be simpler with SHoW DMX SHoW Baby’s instant plug-and-play configuration: For a Transmitter, connect DMX IN, for a Receiver, don’t.When a DMX cable is plugged into the SHoW DMX SHoW Baby’s DMX Input, the SHoW DMX SHoW Baby senses the connection and configures itself as a transmitter. If no cable is connected to the DMX Input, the SHoW Baby configures itself as a Receiver.